2011.03.14: Anderson aims to kick out the rubber while Murray kicks the tires. 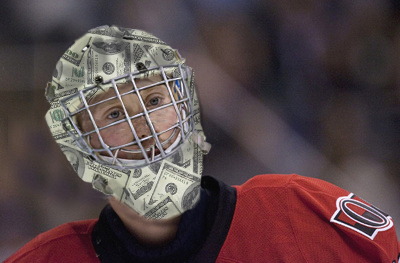 Anyways, the city’s a buzz about keeping goaltender Craig Anderson. He’s an UFA at season’s end and we all know he’s here on a tryout. He’s played well and since Sens highlights are quickly falling in the TSN programming hierarchy he’s a big part of the conversation, positive and negative. Often, Anderson himself is the highlight. He’s displayed some flashy athleticism without a stout group on defence. So its time to weigh in. How long, at what rate? What about Lehner? What about Andy’s chances on the open market? Simple question for you today: what kind of offer, if any, do we give Craig Anderson? I doubt anyone will say they don’t want him back, given someone has to play for this team next year, and I think we can agree that 19 year old Lehner probably isn’t quite it yet. But how high do you go? Would you pay him in excess of, say, $3M a year for 3 years? It’s been exciting to see someone play their heart out for a team nowhere near the playoffs, but I think the sample size is too small to give him much in terms of money or years. He’s been playing out of his mind since coming over from Colorado, facing 40+ shots on most nights and allowing a team of B-list talent a chance to eke out 3-2 games, but no one can keep that up every night. Colorado tried to run with that strategy and ended up running him into the ground. I like him as a player, and would love to see him re-sign, but I just don’t see the organization wanting to pay him more than he makes now, which is about $2M. If he has to take a discount, I wonder why he wouldn’t take a discount for, say, Washington or Chicago. Ottawa might have to overpay to keep him, and I wonder if they should. (Though after our $5M Kovalev experiment, I’d probably be ok with the team overpaying for a character guy who also happens to be a more-than-serviceable goaltender.) So: I’d probably give him the money it will take to keep him, but I also think that’s probably why I’m no GM. Thinking with my heart here. Side question: Is Pascal Leclaire still alive? I think the length of the deal is the most important aspect. Basically the question is how long till we make Lehner the numero uno? How about a two year deal? Worth about 4 mil total. Maybe put some incentives in there to sweeten instead of overpaying? Do you think he wants to stay? Being an everyday starter is tempting but to face 40 shots a night with some suspect defenders in front of him. If he does decide to stay in Ottawa his stats won’t reflect positively on his time, eventually hurting his chances at a new deal once Robin takes over. Is the rest of the league even watching Ottawa anymore? What would be the market? I’m sure there’ll be interest but the Sens will probably over value him thus bidding against themselves. Tricky stuff. After Leclaire injured himself during rehab for his current injury that he had received during the rehab for that previous injury … yeah, I don’t know. Either hiding in a bubble in his basement, or confined to a hospital bed would be my best guess. In regards to what to offer Anderson, I think Steven’s picture says it best. Although we have a small sample size to go on, I don’t feel like Murray has a lot of other options when it comes to goaltending. Either he signs Anderson to whatever he wants, or we go into next season with Lehner (who is currently injured) as our starter which is just asking for another terrible season. Lehner is great, but at 19 not to mention still in his development phase, there is no way he can carry the team. Good points. With his two year deal with the Avalanche, it was his first time ostensibly being handed the starting gig. You could argue that his one phenomenal season proves that he is capable of, if not definitely is, a starter. Meaning, he’s already taken his short, low-pay deal to prove he can be the go to guy, and now he’ll want term. He’s paid his dues. Part of what makes me so skeptical that Ottawa can re-sign him is that Colorado are in essentially the same boat as Ottawa, and probably would have loved to have him back for two years at $2M per. You don’t just trade away a goalie who was in the Vezina conversation after one bad year – and for Brian Elliott, to boot – unless there’s something keeping a deal from getting done. I suspect that part of the reason he was traded was that he wanted more than the Avs were comfortable providing. All of which makes me think that Ottawa will have to give him *gulp* Leclaire money to stay. Conracts are pretty hard to talk about for the non-GM/player agent (so basically we’re cool seeing as this is an exclusive forum for GMs and player agents to sling the hash) – btw Jay Grossman still waiting for you to get at me about that etting-gay olchenkov-vay ack-bay to the enators-Say thing i paged you about! I KNOW YOURE READING THIS DUDE! Anyway, I go into this thinking aside from Crosby for like 8.7 years at 8.7 million because he thought that would be “pretty cool eh” fans rarely seem happy with contracts. I think why they always seem to be leave one wanting a mulligan down the road is 1. players are human men and not machines 2. because there are two people on the end of the negotiating table – i know i am blowing your heads off with deep knowledge here – the shrewd GM (minus Glenn Sather/ Mike Milbarfy) and the probably even shrewder (wow thats actually a word) player agent – who gets a piece. After a player has finished their entry level and arent seen as a marginal NHLer, there is a fixation on two things maximum payout, maximum term. You get a bit of a an idea why in our post-Marc Savard/Max Pacioretti/You name the player world. Anyway, back to my point about about Term/Salary, Anderson is probably (definitely) in the drivers seat on resigning here…and…the contract is probably going to be disliked by a lot of people if it goes down. For me I would be happy to see a competitive (read: highish/high) salary be offered at the trade off of short term – 2yrs max. Ottawa is actually in a position to overpay a little here and there with so much cap space (our first line wingers are currently Colin Greening and Bobby Butler btw…) for a year or two and maybe plug in a certain Swedish 21 year old entry level scapegoat/saviour/nutcase by then.